Yeah Mon’! Jamaican Bobsled Team! 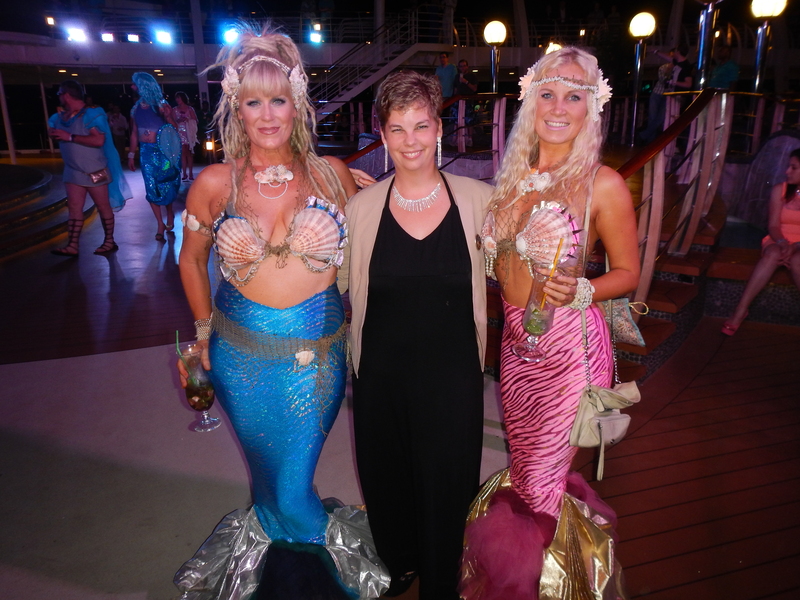 Working as a Social Hostess on my cruise ship means I get to go along on excursions in most ports. There is no certainty to which excursion you will be sent on and while we are often sent on the…less exciting ones… there are times when we get a chance to experience some heart stopping adrenalin rushing intense moments of terror mixed with sheer joy… Bobsledding in Jamaica was one of these for me. We only get our schedules the night before around 10pm, so it is always a surprise as to if and which excursion we might go on. We are allowed to request/suggest ones we would enjoy but 9 times out of 10 it is something out of left field. 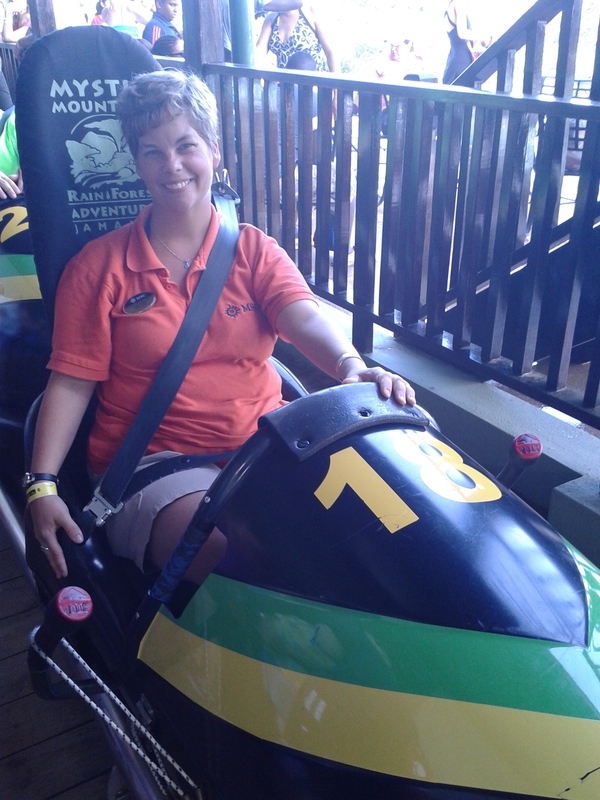 When I saw Jamaican Bobsled Adventure I was dumbstruck (a rare occurrence). I am not a fan of speed, I have never been on a roller coaster (unless you count the pirate ship and even that turns me to jello) and the only thing I could think of was the movie Cool Runnings. But, I try to do what I am told and figured may as well give it a go, and what a go it was. 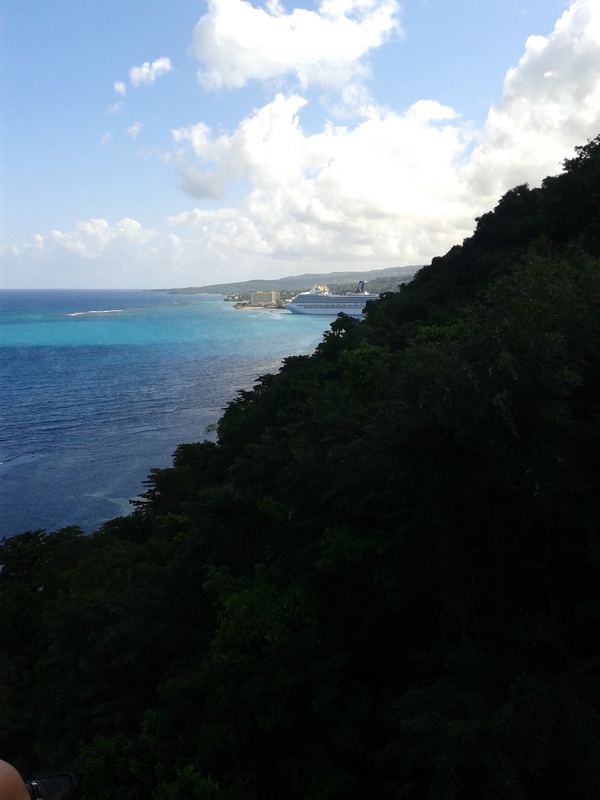 It takes about an hour drive north from the Falmouth Cruise Ship terminal to reach Mystic Mountian, Ocho Rios. Along the drive you are never sure what you may see. 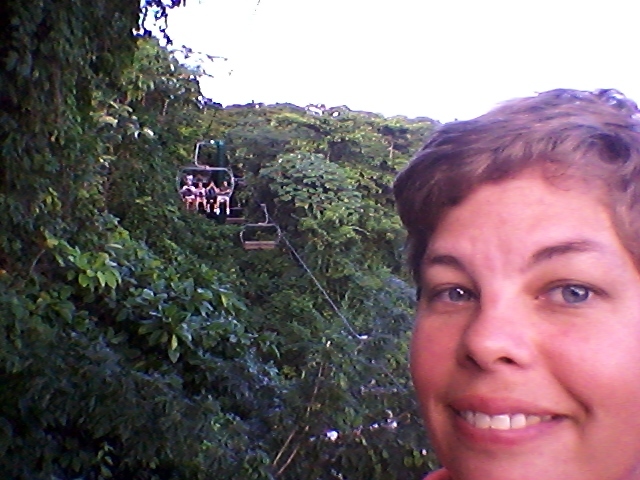 Once there we had a short wait in line before taking a leisurely cable car ride through the lush jungle up to the top of the bobsled ride. Just to give you an idea of how this works, these are 1 person sleds set on rails through the jungle. Usually the driver goes alone, but in cases of kids or those struck with terror, you can hook 2 sleds together. The entire ride is gravity fed, but there are levers to control your speed. However, if you control your speed too much then you will get stuck on the rails, causing the staff to come fetch you and you looking embarrassed once fetched. We waited in line for over an hour as 2 people, from a different cruise line, breaked too much and got stuck. As the manager went to go get yet another victim of fear, he mumbled something along the lines of “If anyone else breaks… I swear….”. I feared that I may become the next victim of his wrath. One of my amazing guests, a 22 yr old French Canadian lad offered to let me hook up to his bobsled and he would do the driving. 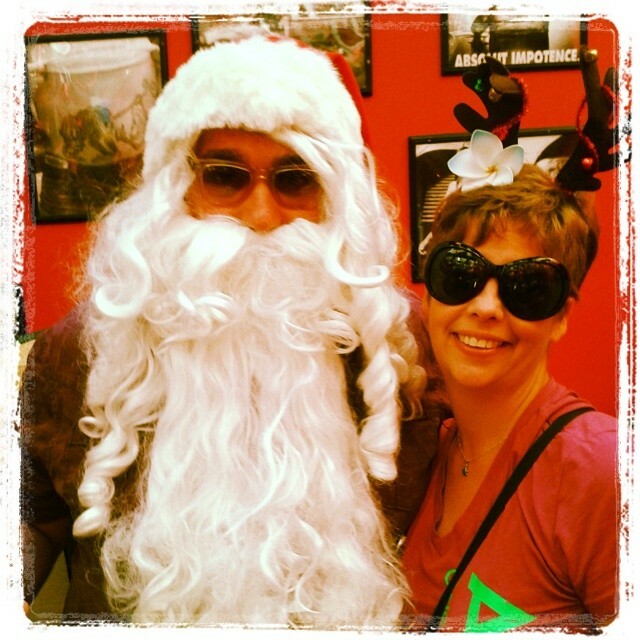 We decided this was best…. Needless to say the mandatory photo that is taken shows my cohort screaming with glee, arms in the air. As for me all you see if the hunched over back of someone screaming in terror. A little late in publishing but finally got it done. 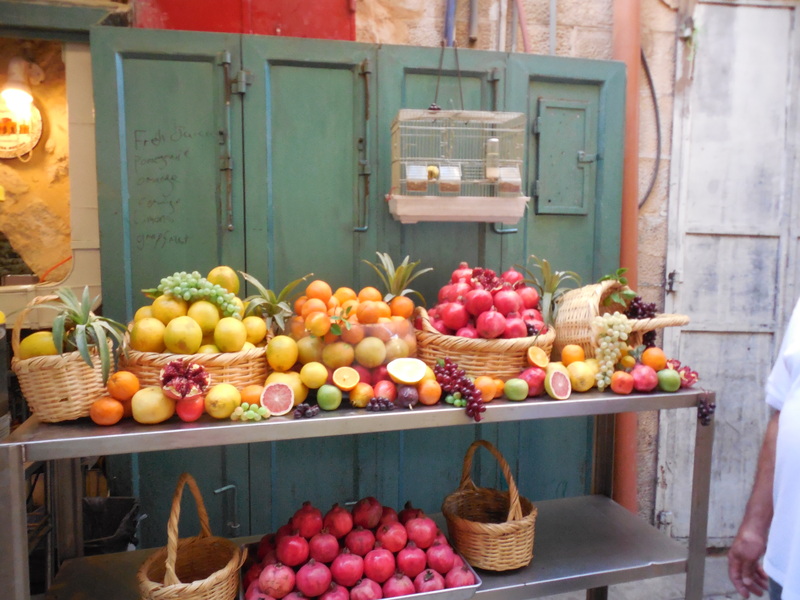 From my time on MSC Lirica during the summer of 2013, Haifa, Israel was one of our stops. I have never been particularly religious in the typical sense. From my travels I have encountered faiths from all around the world from Catholic, to Buddhism to Muslim, to almost everything in between. Don’t get me wrong, I went through a period when I was a Sunday school teacher in High School and part of the local youth group. But after numerous adventures and cultures I prefer keeping my faith as something for myself. I love discussing religion and discovering the nuances of all the different beliefs, in fact at youth group I would always end up being that one in the middle of the table questioning. I grew up hearing the tales of the old and new testament, and well we were told they were true, for the most part they always felt like just that.. tales. That is why it was no surprise that I chose to float in the Dead Sea, a long time dream of mine, before visiting one of the most sacred cities in the world for many cultures. Luckily working on a cruise ship allows you these sorts of choices and eventually I got round to getting the chance to exploring this ancient place. The early morning started at 5am for us with a 2 hour drive from the ship and I woke from my nap just as the bus entered the outskirts. Even before my driver began explaining things I just had this overwhelming, bordering on emotional, sense of awe wash over me. It seemed so obvious, when before it was kind of sketchy, that the stories I had grown up with were, in fact, based in truth and most likely completely true, in some form or another. 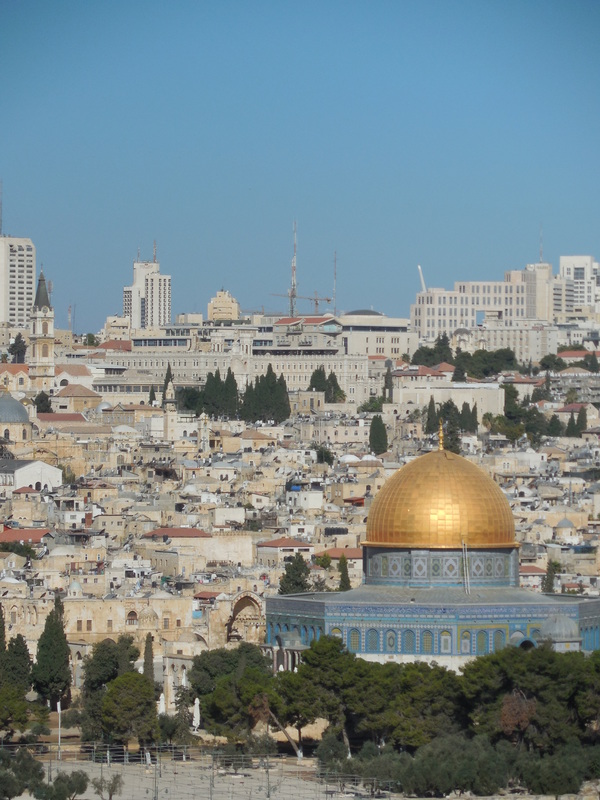 Our first stop was a view of the Temple Mount and the Dome of the Rock in the Old City of Jerusalem. It was truly breathtaking. 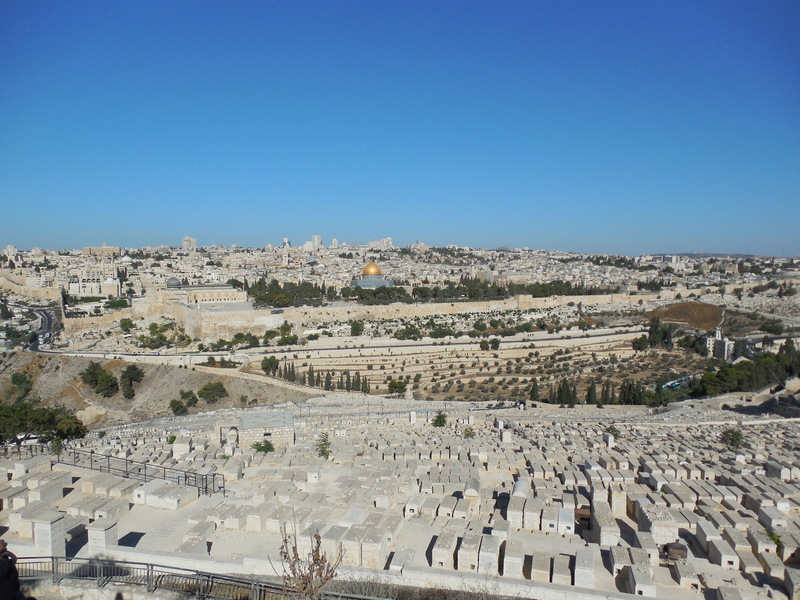 Temple Mount with Dome of the Rock in background and cemetery in foreground. Known to many as the Wailing Wall because of the thousands who come to pray and leave messages, the Western Wall is something to see and experience. 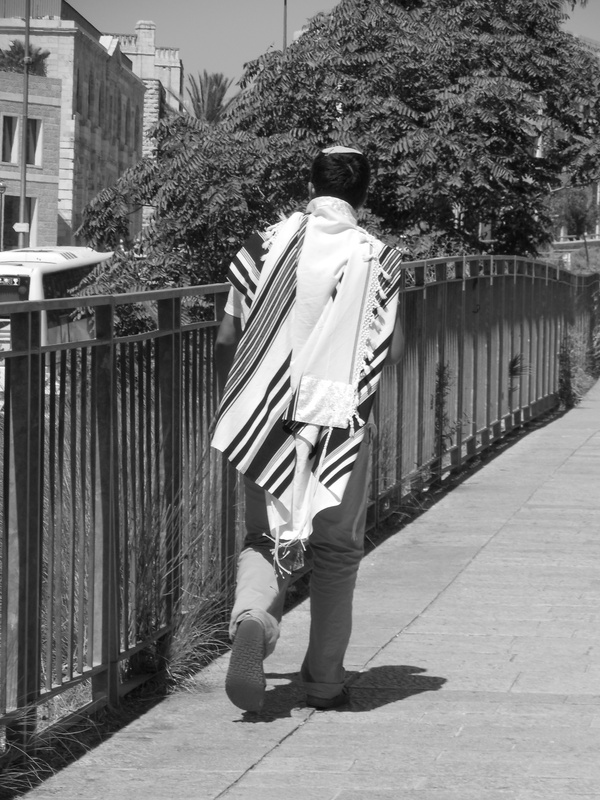 We arrived on the first day of Rosh Hashanah*, the Jewish New Year. 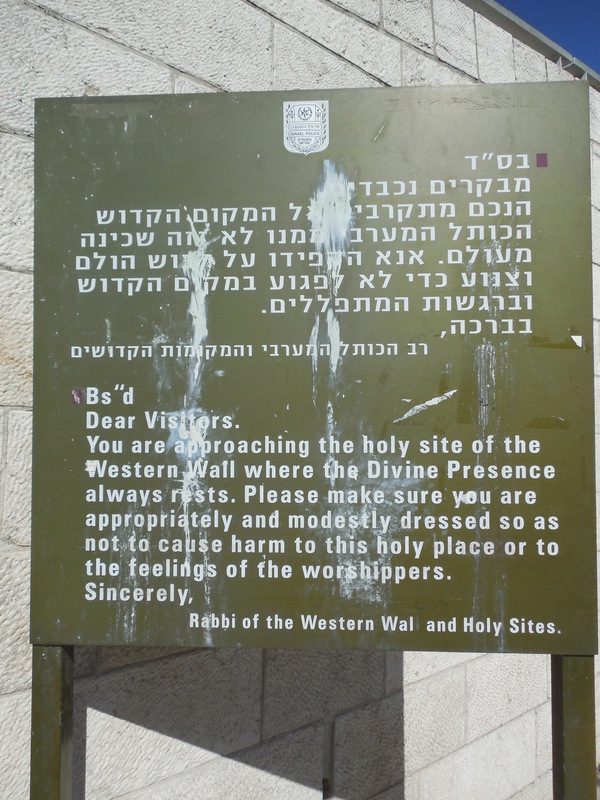 This meant that there was no traffic anywhere and thousands of pilgrims at the wall. It also meant that no photos were allowed, which was a bummer as the people who came to pray that day were amazingly beautiful. Not in the typical “magazine cover” sense of the word, but in the cultural aspect, and the looks of absolute love and religious fervor that the wall seemed to instill in people. I had a very itchy finger wanting to take pics. But I opted to obey the rules…and show respect. I wish I could paint you a picture of how amazing this was. 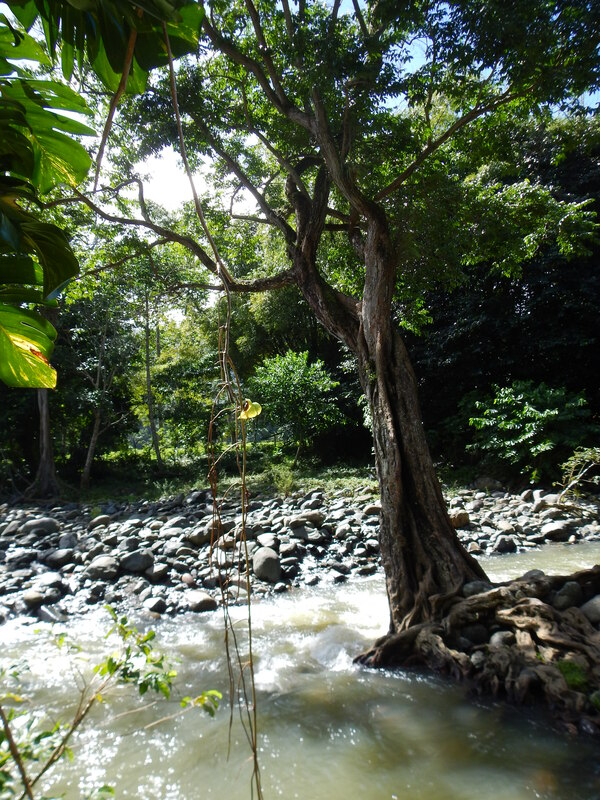 I wish I could have sat and just watched the flow of humanity, often seeing it in it’s rawest and truest form. The wall has a male and female side. On the male side it looked like a full party rave going on. 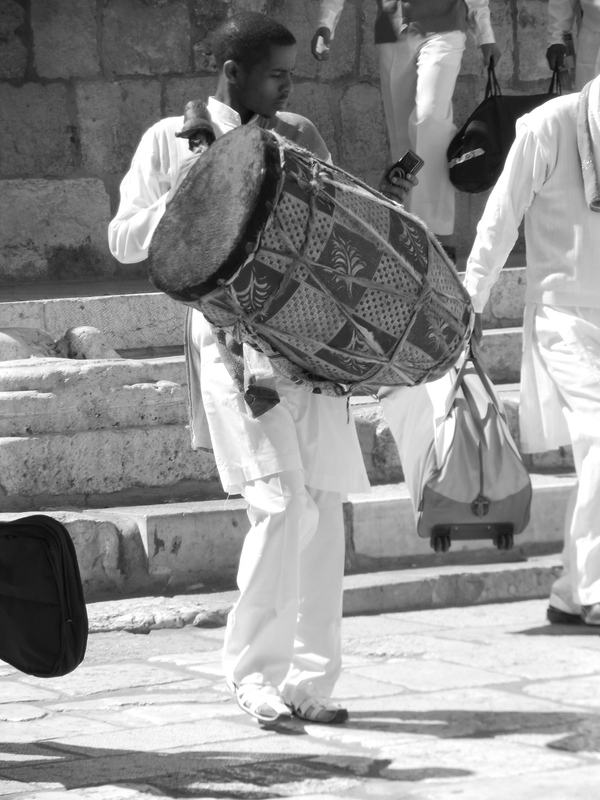 Men were chanting and dancing and singing, the intensity increasing with every word uttered. They were lifting chairs above their heads and you could see the religious fire burning in their eyes. On the women’s side it was the complete opposite. 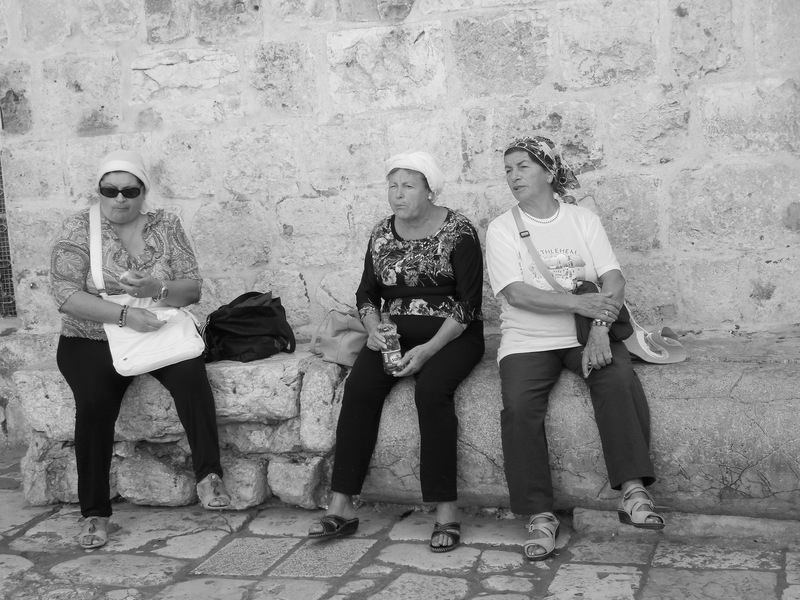 The women were silent except for some whispered prayers, there was a quiet dignity about them. All ages, all races and most likely many religions. Some were just sitting and reading the bible, sharing their beliefs with younger generations. I walked down found a scrap of paper and wrote down my prayer, my hopes, my dreams…found a space between the rocks and, resting my head on the ancient stones, placed it well pouring all my positive energy into what I had written. 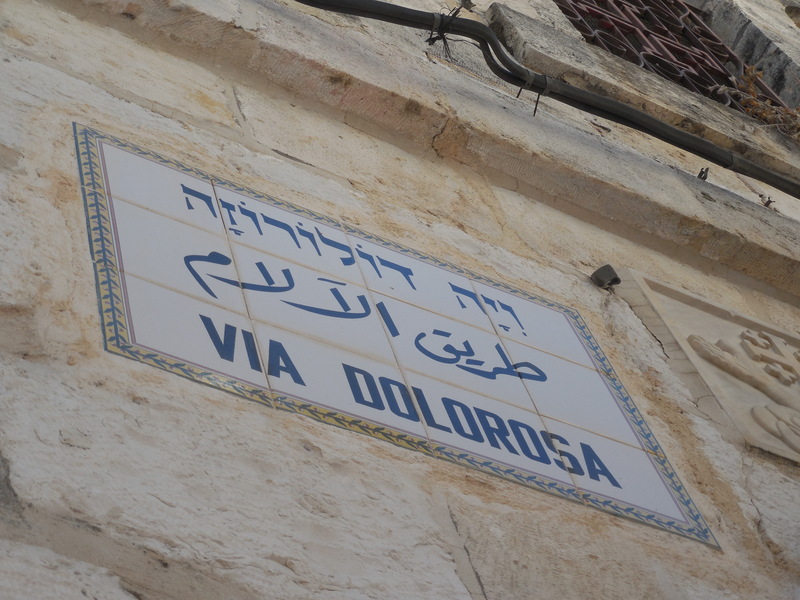 Heading further into the Old City of Jerusalem, we left the Western Wall behind us and continued towards Via Dolorosa, or the “Way of Sorrows”. This is the route Jesus was made to walk while carrying the cross to his crucifixion. The winding cobbled street passes from the Antonio Fortress to the Church of the Holy Sepulchre, around 600m/2000ft. 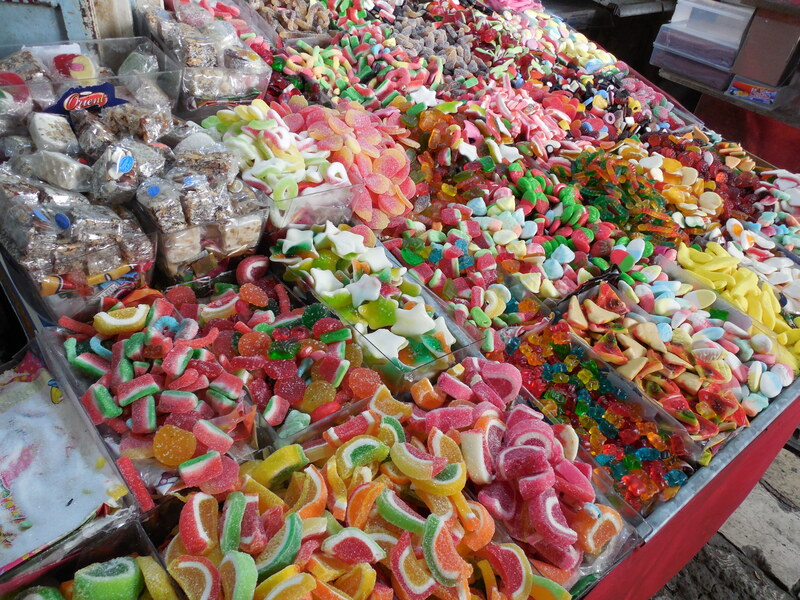 Today it passes by bakeries, fruit sellers and souvenir shops. I wonder if the people living here today pause to think about the significance of this path or if it lost to them as so many other world marvels are lost to the people ho see them everyday. The route has changed over the years, but this one has been established since the 18th century, along the way tehre are nine Stations of the Cross. 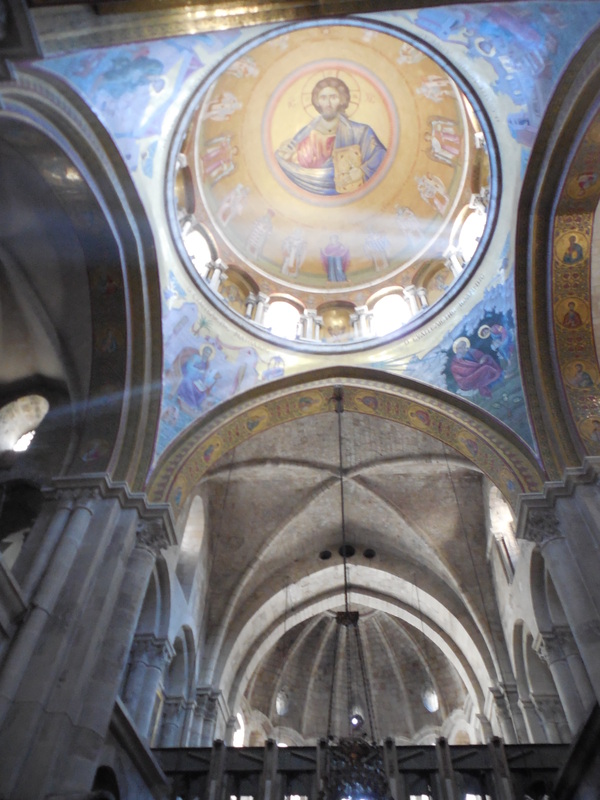 Places where it is believed Jesus stopped, or fell or met certain figures, such as Mary. At the fifth station, known as the Chapel of Simon of Cyrene, it is believed Simon carried the cross for a ways. 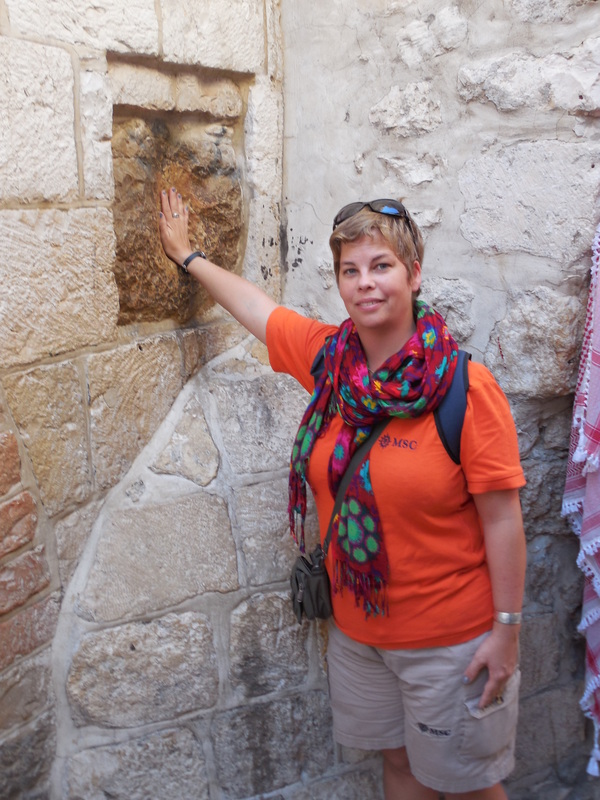 Jesus is said to have lent on the wall and left a bloody hand print, this spot is now much revered and has worn down over centuries of being touched by followers and tourists alike. 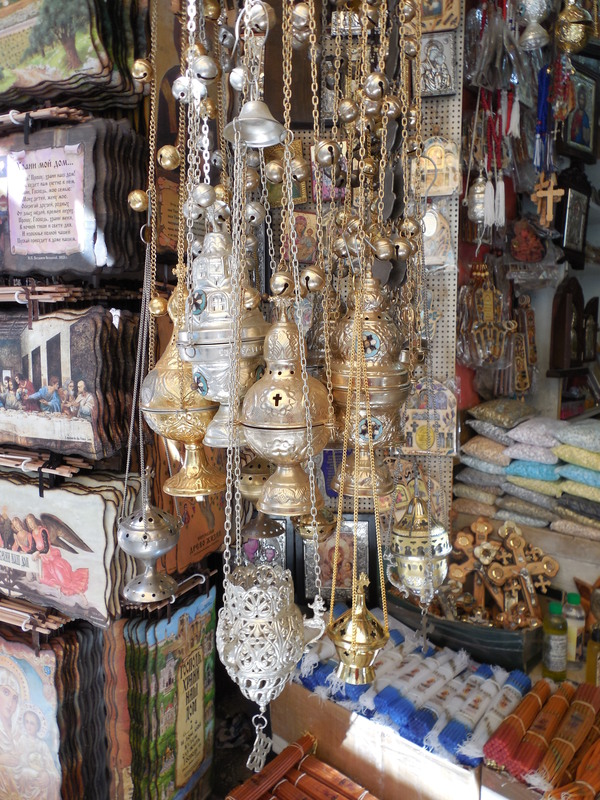 As we meandered along this sacred route, I was struck by the people, the scents, the sounds. Life seemed so real, so alive, you never knew what you might find around the next corner. 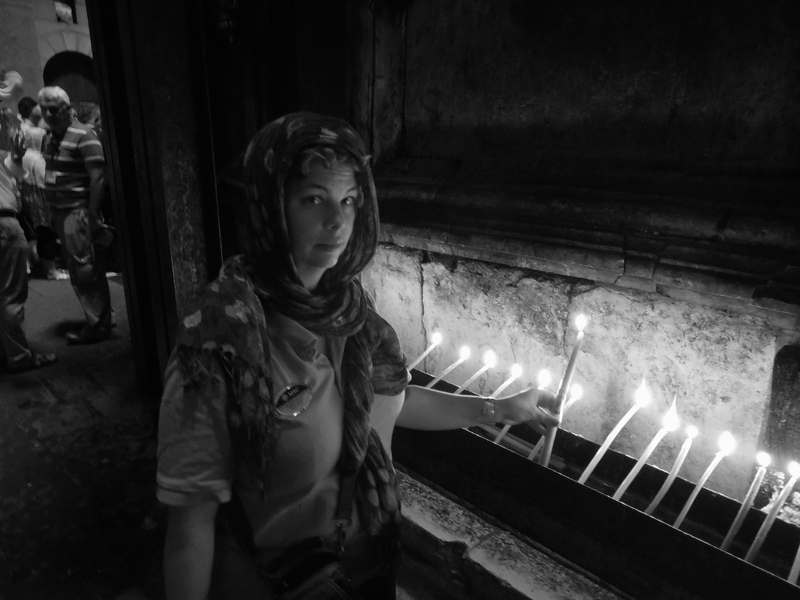 Soon, we neared what is considered the most sacred site of pilgrimage for Christians, the Church of the Holy Sepulchre. It lies on what is believed to be the hallowed site of Golgotha (The Hill of Calvary), where Jesus was crucified and is also said to contain where he was buried and later resurrected. 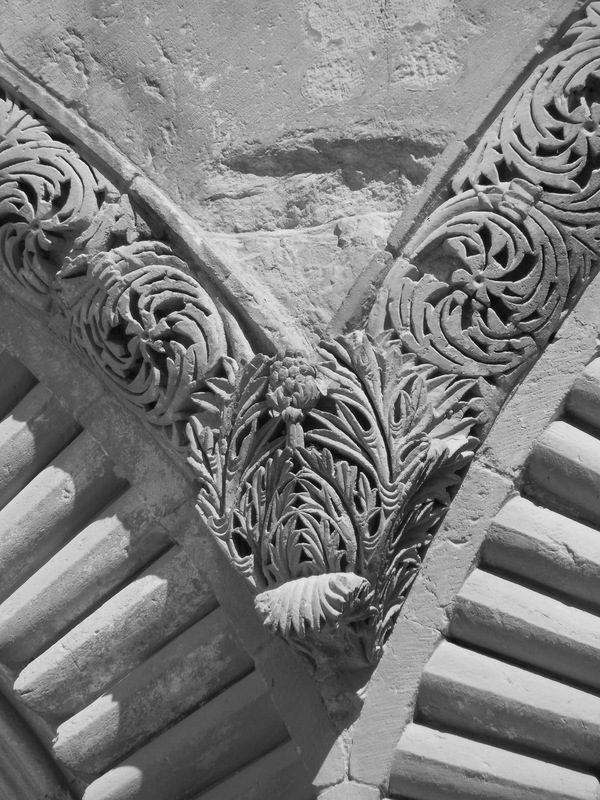 The church now plays host to the headquarters of most Christian sects, ironically enough, due to much…disagreement… between these sects, it is a Muslim family who holds the key to the ancient door. They have been responsible for it for over 1,300yrs. (Article in the SFGate telling the tale). 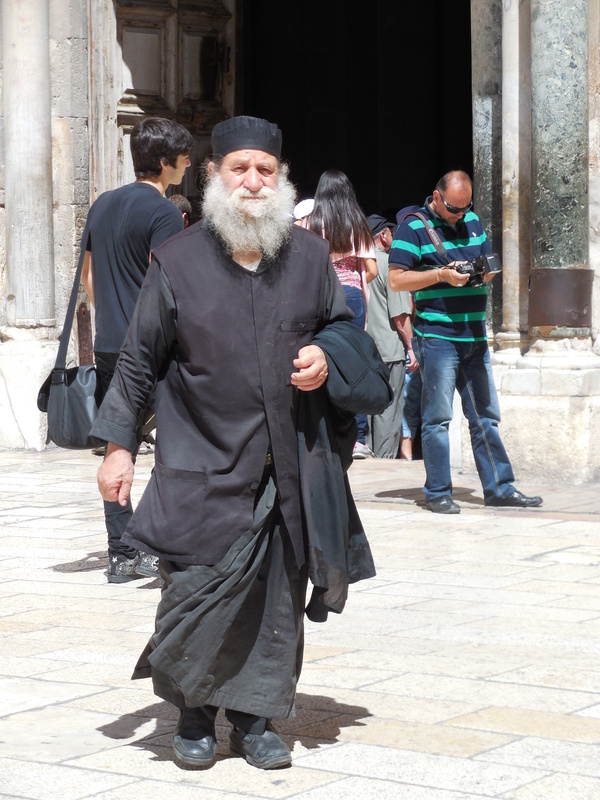 Out in the courtyard you see pilgrims from all walks of life, all sects of Christian religions, all nationalities. I was in awe of this place, and you could feel the love and hope virtually emanating from the hundreds of people, most of whom had probably planned and dreamed of this day. 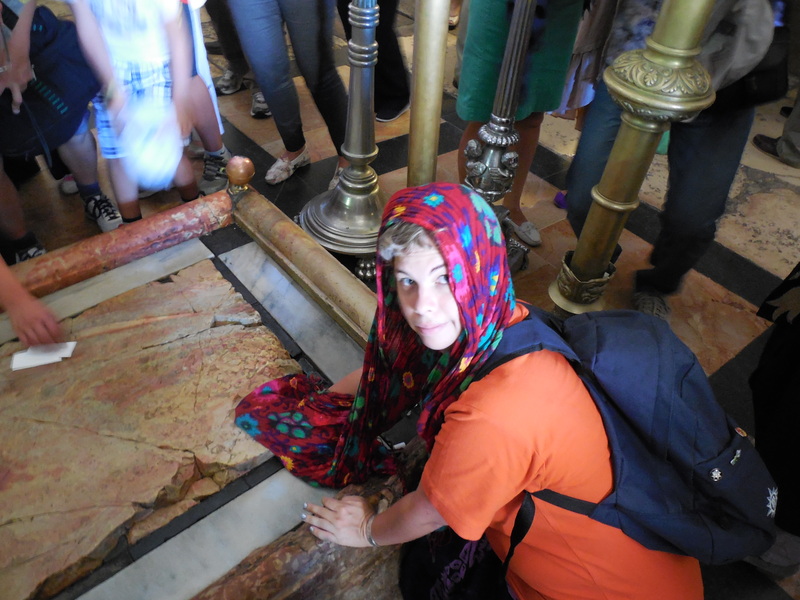 Just inside is the Stone of Anointing, a large slab (added in the 18th) century on the spot where Joseph of Aramathea was said to have prepared the body of Jesus for burial. Pilgrims take an item of clothing or jewelry and rub it on the stone as they pray, hoping to bring blessings to the item. 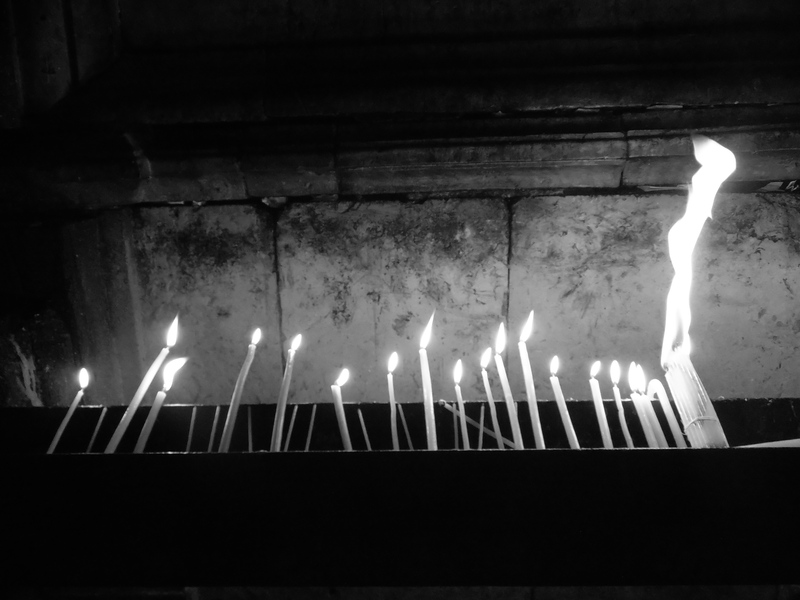 Our group purchased candles from the Church store and lit them saying a prayer. Some get over enthusiastic and think the bigger the bundle the more likely their prayer will be heard, this is when a priest comes in and has to douse them so that a fire doesn’t break out. 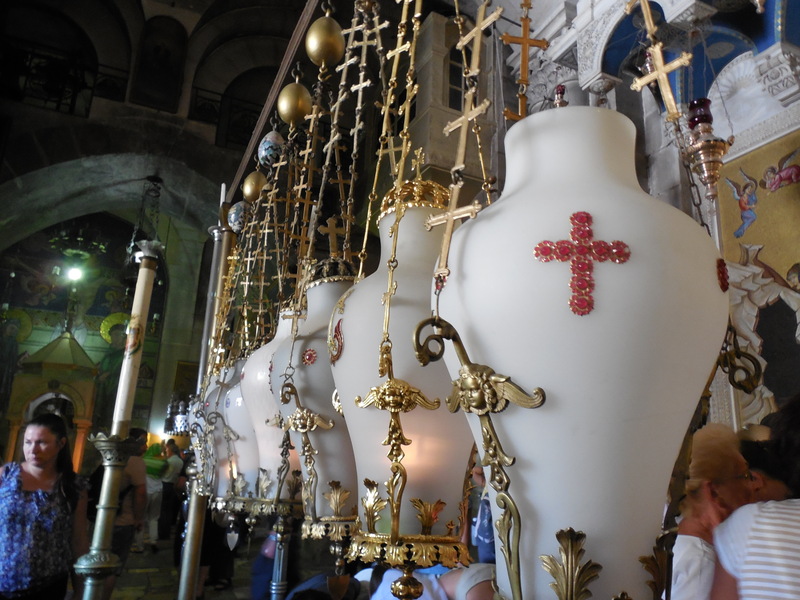 The lamps that hang over the stone are contributed by Armenians, Copts, Greeks and Latins. Another interesting anecdote about the Church is what has been named the Immovable Ladder. 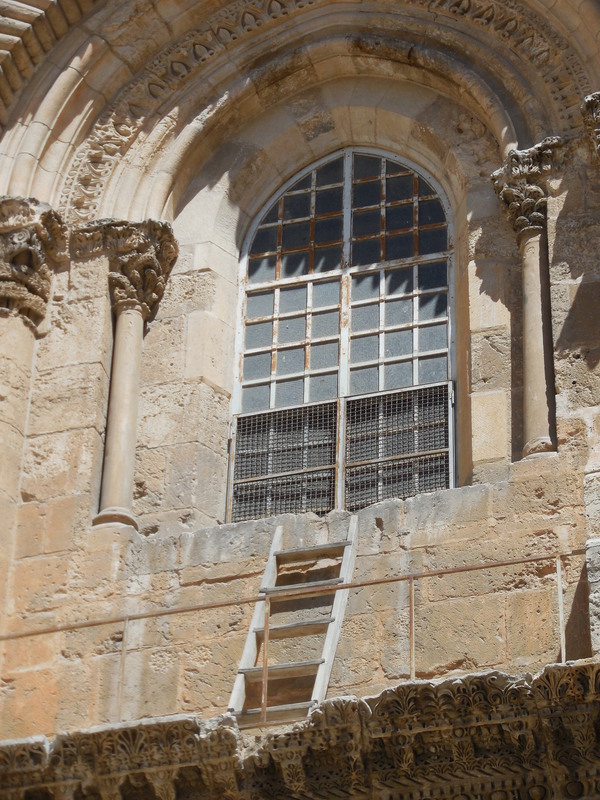 This is a cedar ladder (the wood is believed to originally have been from Lebanon) that was placed below a window on the outside of the Church of the Holy Sepulchre during some construction. However, during a disagreement between the Christian sects, an understanding was made that no cleric of the six ecumenical Christian orders may move, rearrange, or alter any property without the consent of all six orders. Since getting consent of ALL the orders is near impossible, the ladder was not allowed to be removed and has therefore become Immovable and a symbol. It was first mentioned in 1757 and is replaced when the present ladder disintegrates over time. 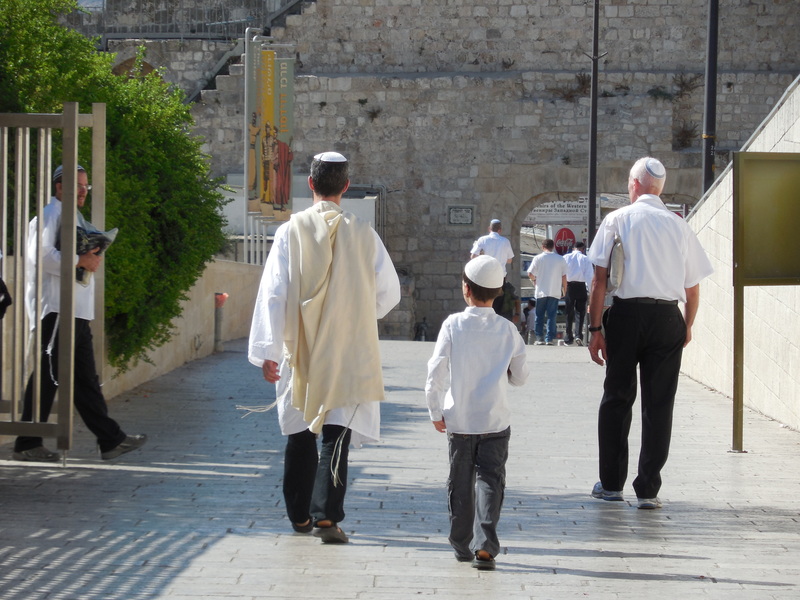 and we headed out of the Old City with many other pilgrims in search of new inspiration and understanding of the world around us. Personal Note – it truly saddens me that a place that has more history in one stone than most places in the world and that should bring the world together due to it’s significance and meaning seems to be constantly at war. The people I met in Israel were inspiring and welcoming and I hope everyone visits and learns to put old prejudice aside. *Rosh Hashanah (Hebrew: ראש השנה‎, literally “head [of] the year”), is the Jewish New Year although the real name for this Feast of the Lord is called Yom Teruah (Hebrew: יום תרועה‎, literally “day [of] shouting/raising a noise”) or the Feast of Trumpets according to the correct biblical calendar of the 1st and 2nd temple period, not Rosh Hashanah. It is the first of the High Holy Days or Yamim Nora’im (“Days of Awe”) which usually occur in the early autumn of the Northern Hemisphere. Rosh Hashanah is a two-day celebration, which begins on the first day of Tishrei. The day is believed to be the anniversary of the creation of Adam and Eve, the first man and woman, and their first actions toward the realization of mankind’s role in God’s world. Rosh Hashanah customs include sounding the shofar (a hollowed-out ram’s horn) and eating symbolic foods such as apples dipped in honey to evoke a “sweet new year”. Quite often the MSC Divina plays host to large groups and partial charters (where a group is large enough to take over half but not all of the ship). Let’s see, recently we have had the Irish Music group, the Polka group, the French-Canadian Country Music group, there was even a much feared VEGAN charter (I had a non vegan guest whisper fearfully in my ear “will they make us eat vegan food??”). 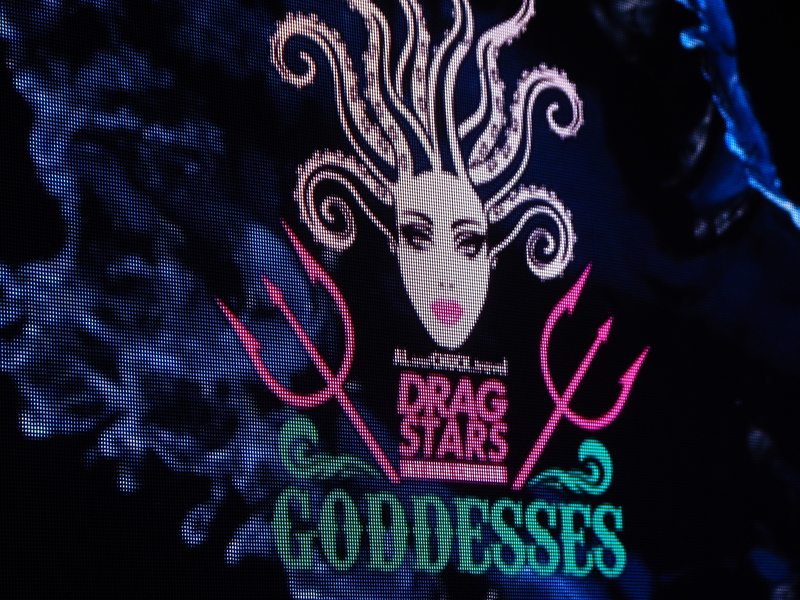 Such as this event during the Drag Queen Charter. One of our artists, a big strong guy from Poland, and I were at the crew gym. He was lifting weights and I was stretching, all of a sudden we both look up and here is this 7ft Amazon wearing….glitter! Yup a touch of glitter on all the vital areas. 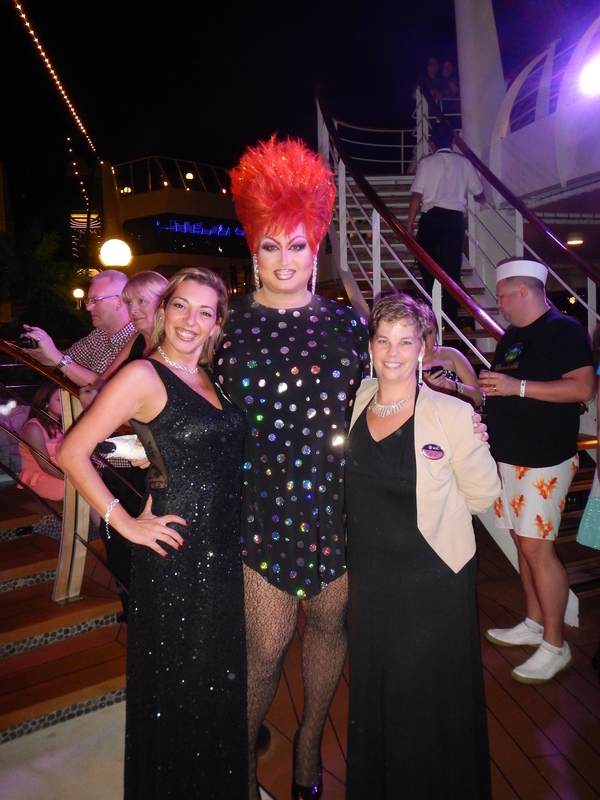 Needless to say both of us were speechless as “she” (recently), said “excuse me but where’s the bar?”…. My brain couldn’t even comprehend this comical nature of this event, so all I could do was guide her to the elevator, through the crew area (with numerous guys passing out from lack of blood to the brain). At the elevator I did mention “ummm you are beautiful but we ummm have kids and well husbands onboard..”. My mate was still holding the weight in the same position when I returned to the gym! Then there are the occasions where we also have FULL charters, this is when a group takes over the entire ship. They usually take over the program, the entertainment, sometimes even the menu… These usually mean a lot of the crew get downtime. 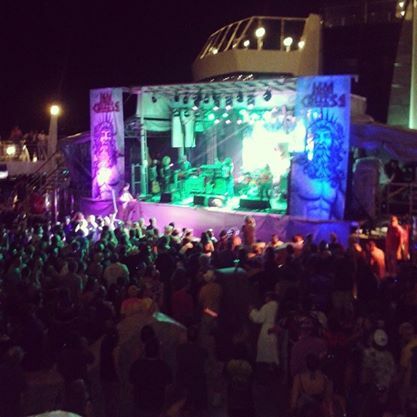 This particular week included the legendary JAM CRUISE followed hotly by the infamous HOLY SHIP! Now you might be asking me… Holy whatsamacallit???? 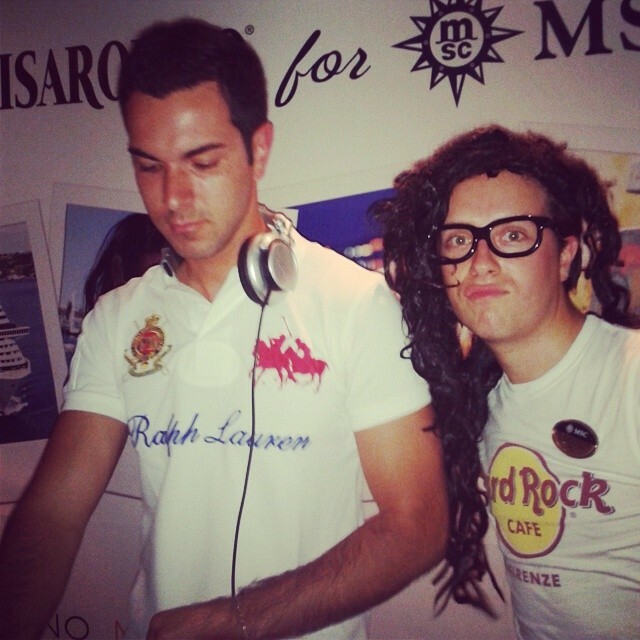 Yup these are two insane, crazy, wonderful party cruises. JAM CRUISE is the… how do I say this in a politically correct way… the HIPPIE cruise, there is an older crowd and a lot of “medicinal” smoking, all over the ship (our cabin stewards were exceptionally relaxed working in the corridors). The crowds were super kind and friendly. At the beginning of the cruise I walked passed one of the public bathrooms and discovered a large, happy group circling the door. I asked if this was the bathroom greeting committee and next thing I knew I was bedecked with numerous items such as a flashing turtle pin and a flashing necklace, then repeatedly hugged before the group seemingly floated off. A very surreal experience. And a variety of fun hip bands such as this group, who had a sort of 70’s funk thing happening. The guests were so laid back that no one even cared when weather prevented us from reaching our final destination of Half Moon Cay, which was a pity as it is the crew’s favorite island. When the guests headed out the housekeeping staff had a huge job of cleaning up, luckily another charter was following with a similar theme but a younger crowd. Holy Ship is pretty much the opposite of Jam Cruise. Jam was chill, Holy was a rave, with DJ’s and famous names like Ferrel Williams and Srillex (or something like that). 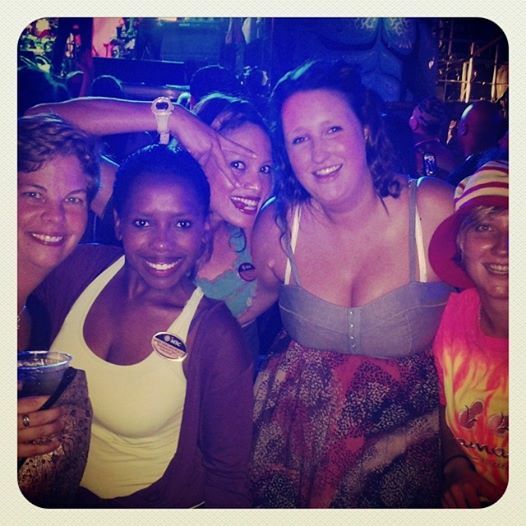 The guests preferred a variety of recreational aspects… shall we say, that most would enjoy at a rave. This crowd was fun but insane! Randy youngsters running around all over the place, a few shower doors were broken (apparently 2 is the limit for the shower), lots of girls wearing… stickers (much to the delight of all of the male species), in general life being lived to the max. 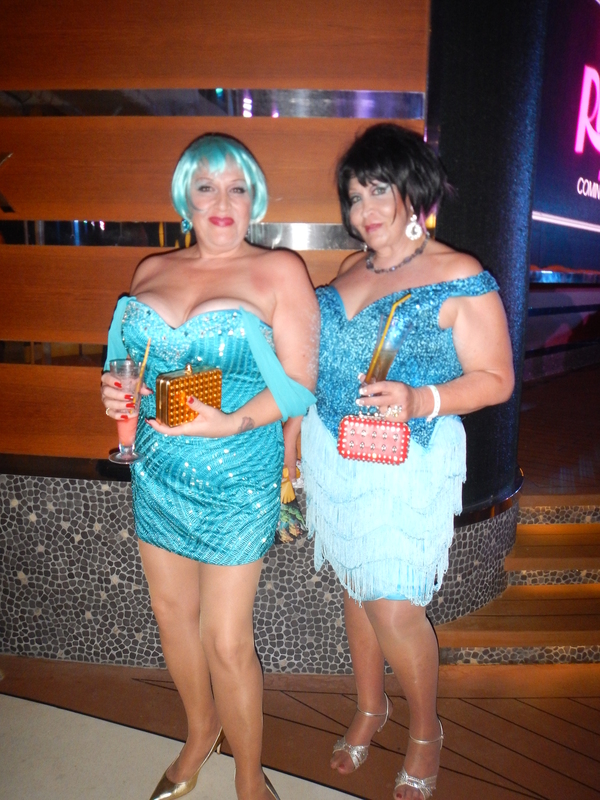 Our last two days were on Great Stirrup Cay and Coco Cay. Two private islands right next to each other (which meant we didn’t have to move the ship that night), and two ultimate beach parties, with many famous names spinning the records! If we thought trying to get the relaxed Jammers out, try getting the hung over Holy’s out… poor housekeeping had their work cut out for them (imagine 3 days of spring break in a contained area after Holy Ship) and we braced for the return of regular demanding passengers. Apparently there were still hand prints and glow in the dark stars on a few cabin ceilings weeks after these 2 particular charters. Ahhh the joys and tribulations that is a charter!! I was supposed to have a ship visit and so was exempt from the crew drill planned for that day in San Juan, Puerto Rico. At the last moment the ship visit was cancelled, but I was still exempt. 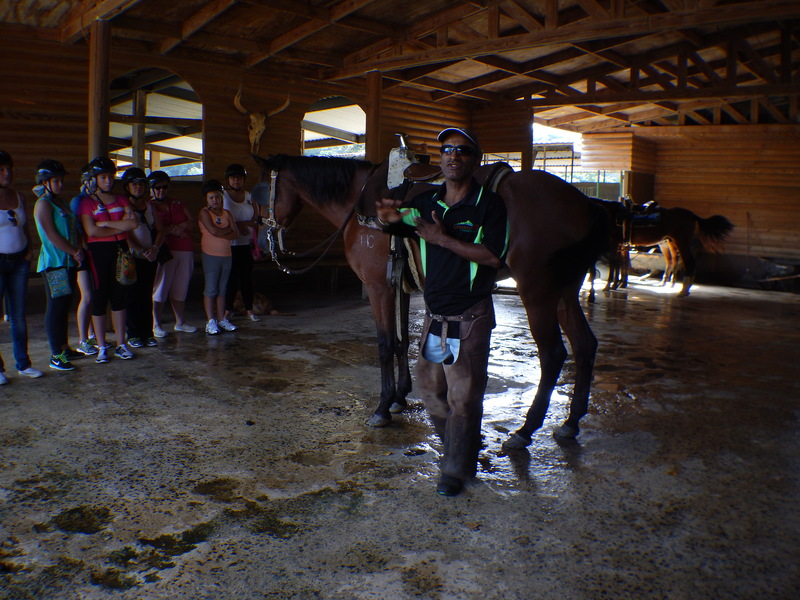 So after a quick scurry to chat to the tour manager I was lucky enough to be given the horseriding excursion. 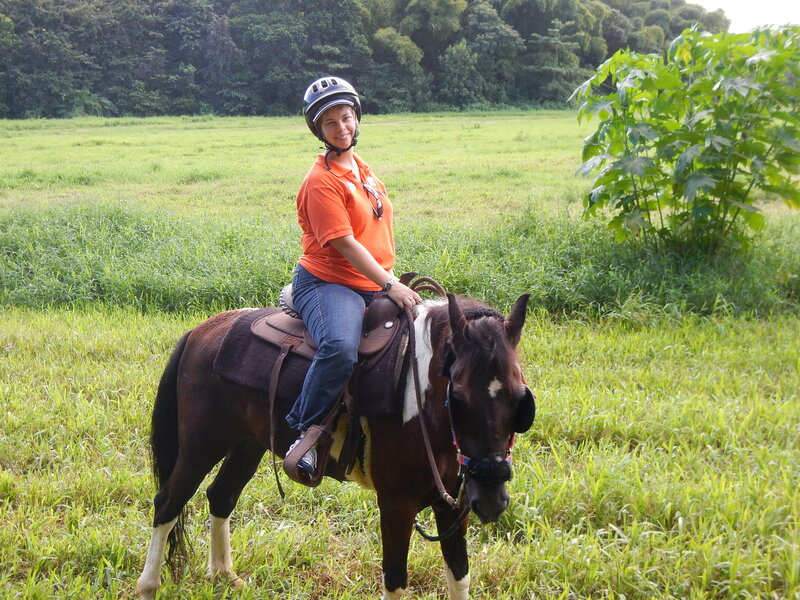 I was super excited as it has been years since I have been riding and it isn’t often we get to go on the excursions we hope for. 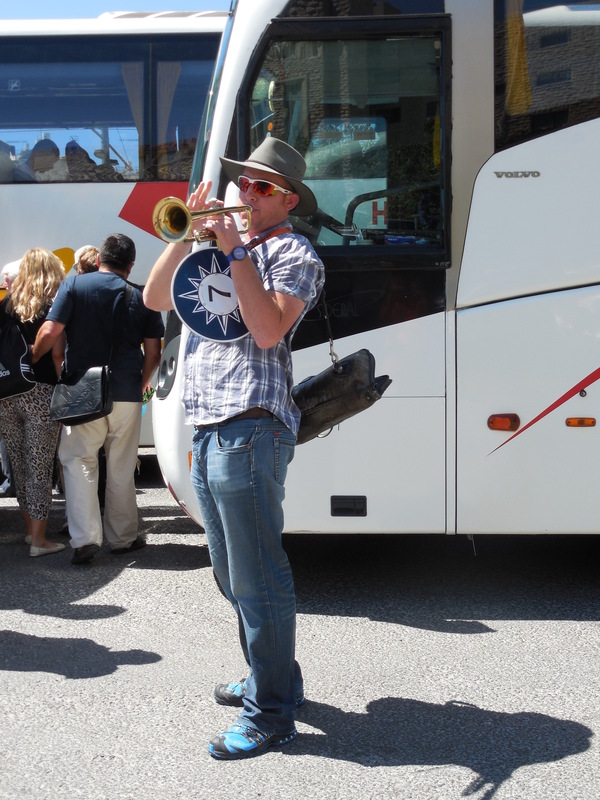 A quick presto packo, to stick my jeans in my bag (technically we are not allowed to wear jeans when we are working, but horseriding in my excursion shorts was not going to happen) and I was off. To get to Carabali Rainforest Park there is about an hour drive, so I sat back relaxed and snacked on the croissants I had grabbed in the mess (sshhh don’t tell anyone I took them). Once we got there I quickly changed and then headed over to the briefing. The guys from Carabali were fantastic, super professional and great fun. 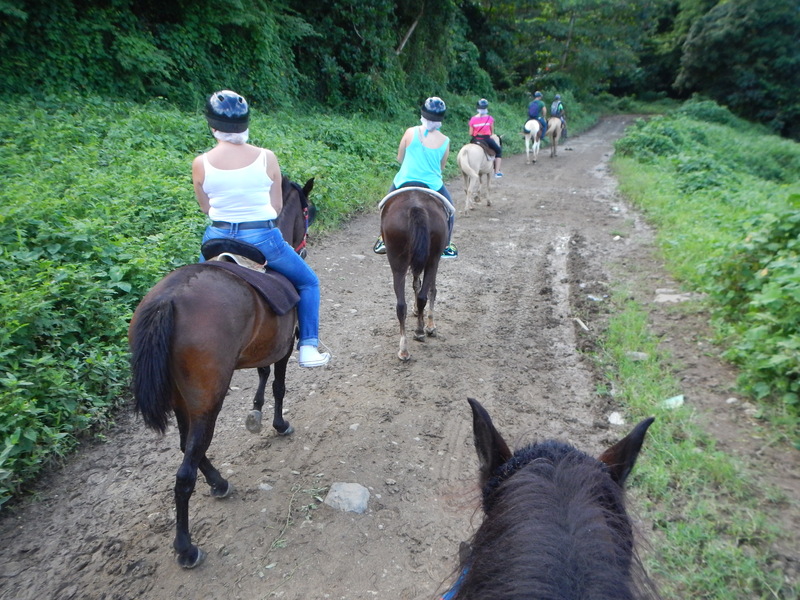 They sorted us into beginner and experienced (further separated into “been on horse at least 3 times” and “have a good idea of what we are doing”). I have done some lessons, back in the dark ages in University, and have some idea of what I am doing, so I was given “Tyson”. As I mounted him my guide told me “he is great but has an attitude, he doesn’t like to be in the back”. That was an understatement, it was me first all the way. But he was a super sweet horse and once I got used to his bouncy canter we were right as rain. 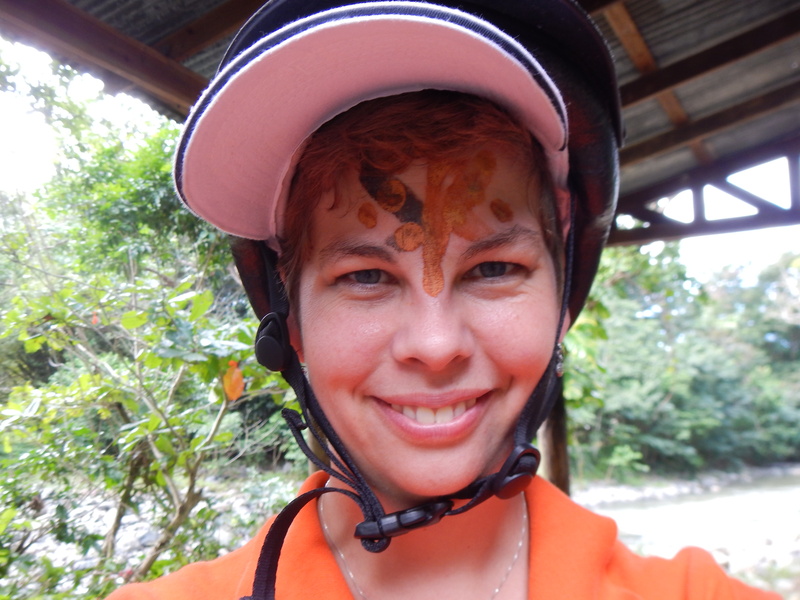 We rode through the edges of only true tropical rainforest in the territories of the USA.It was spectacular and reminded me a lot of where I grew up in South Africa. 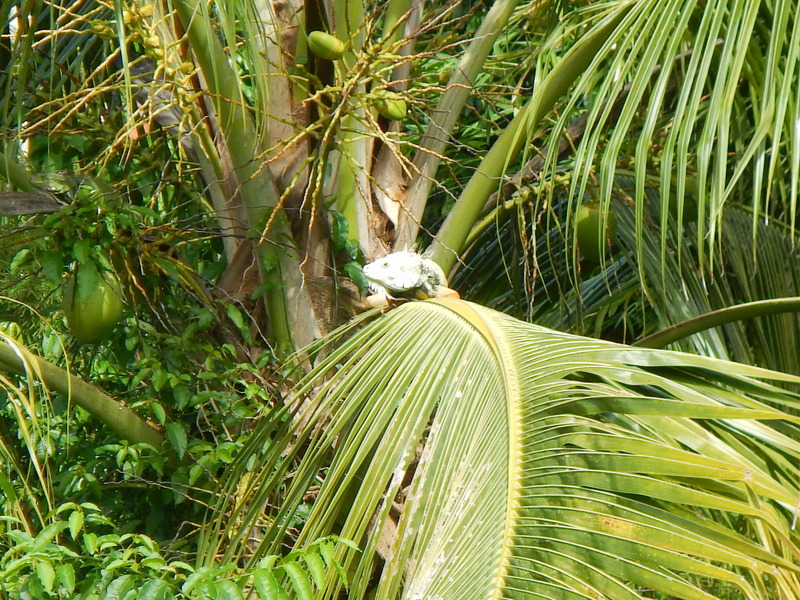 The main difference being, while we had vervet monkeys swinging through the trees, here giant iguanas sun themselves on the palms. 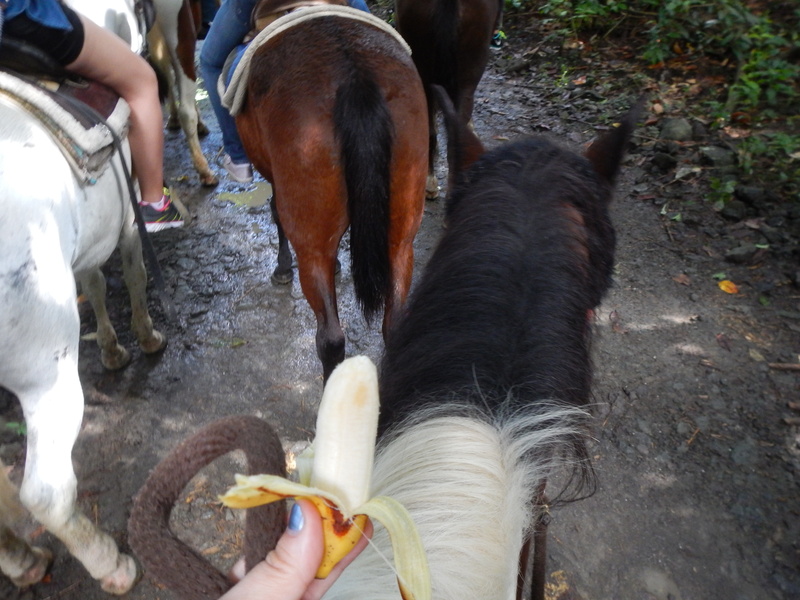 During the beginning of the trail our guide had us stop and he dismounted, then he started telling us all about jungle bananas. they are much smaller but taste like 5 bananas combined into one little mini banana. I had tasted them before in Ecuador when I worked in the Amazon (feel free to browse previous blogs from 2011 for those fantastic adventures), and remembered how good they were. It was truly relaxing and beautful making our way through the jungle, chatting with the guests (usually as Tyson pushed past to get near the front) and the guides. We stopped in an open glade for a photo stop and then headed to the river. 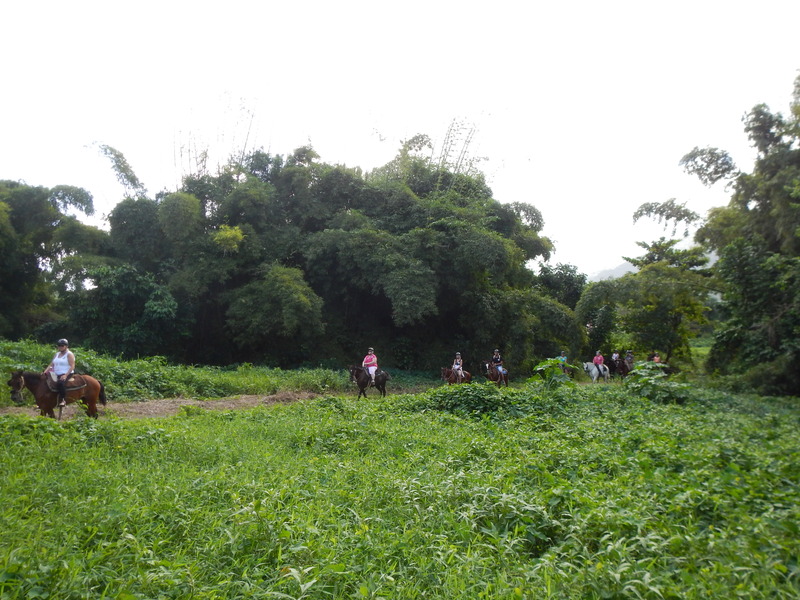 At the river we all dismounted and the guides corralled the horses. 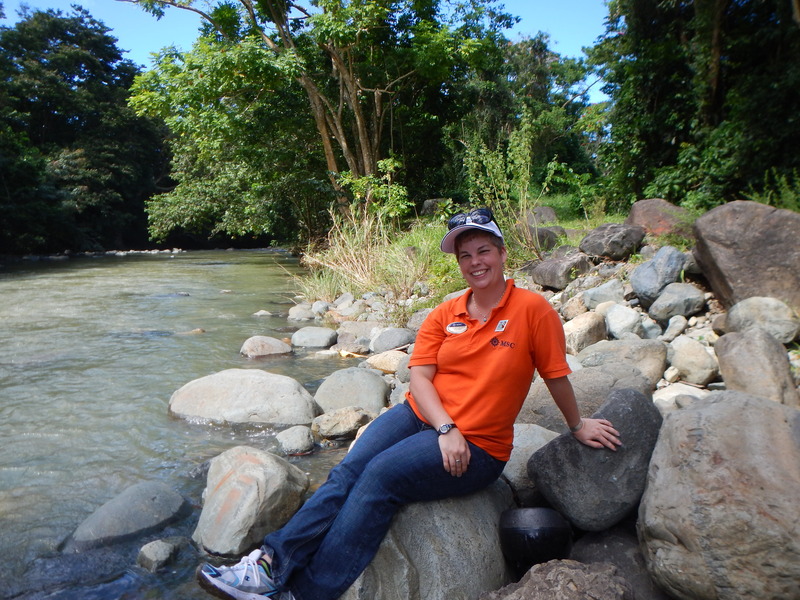 There were drinks available for purchase and we all relaxed next to the river for 30min. The guides told us more about the history of Puerto Rico and how the native people used different color rocks to make face paint. Of course we had to experiment with this. 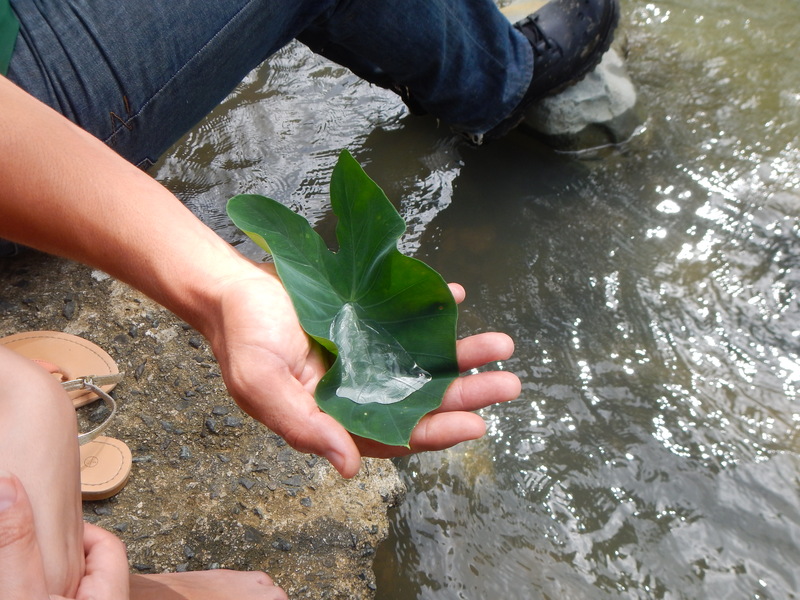 We also learnt what kind of leaves they used to transport water, they are completely waterproof. 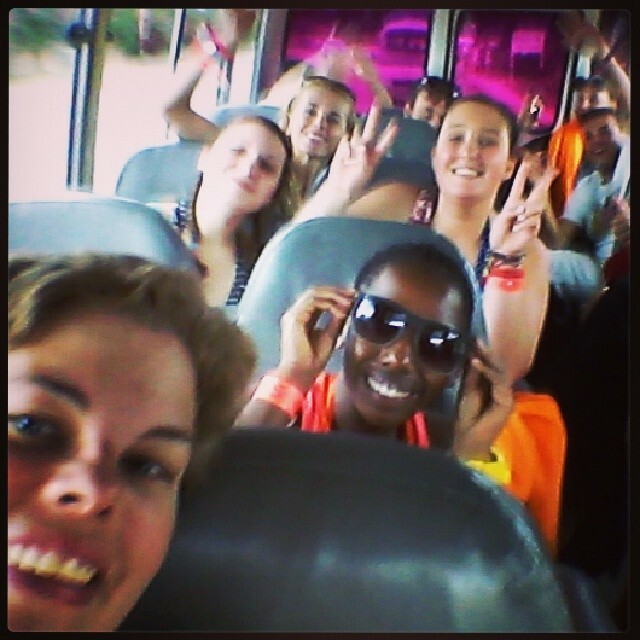 All in all a fantastic day and I loved every minute of it. 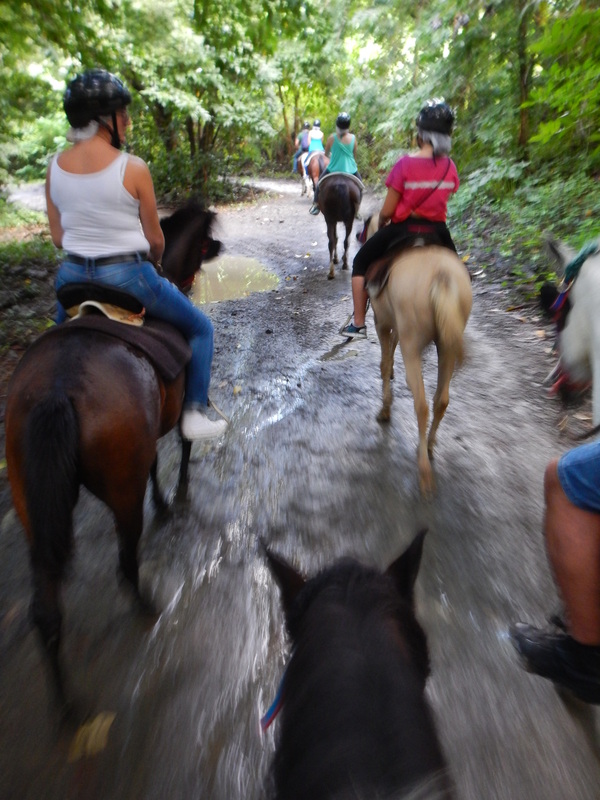 I highly recommend anyone who is the general area of Puerto Rico to visit the Carabali Rainforest Park and go for a horse ride. For as long as I can remember the ocean, and it’s creatures have fascinated me, and I have had a love of Dolphins and Whales. A year ago I got to scuba dive with whale sharks, marking a tick on my bucket list. Just a few days ago, through a crazy coincidence, I was able to go swimming with dolphins, marking yet another tick off. Part of my duties as an English Social Hostess on board Divina, is to take visitors, usually dignitaries and officials, around the ship on a ship tour. I met all range of interesting people, but I must say, the group from Falmouth, Jamaica were by far the most animated, fun-loving group of officials I have yet met. In fact I got 2 marriage proposals (including one of them getting down to one knee). They insisted I join them for lunch in the ship restaurant after the tour, (after I got permission), and we had a great chat. One of the officials, William Tatham of the Port Authorities (if I remember correctly) gave me his card and said next time we were in port he would organize something for me. Well, my mom always said I have no shame when it comes to taking people up on their offers, and so two weeks later when we were due to arrive I dropped him a message. 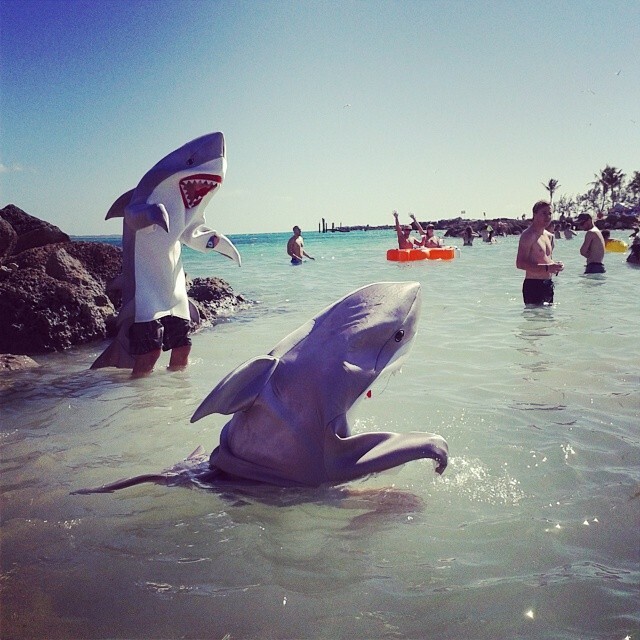 Next minute, I get an email from Dolphin Cove inviting me to experience a VIP tour and dolphin swim at no charge!!!! I couldn’t believe it, wow! 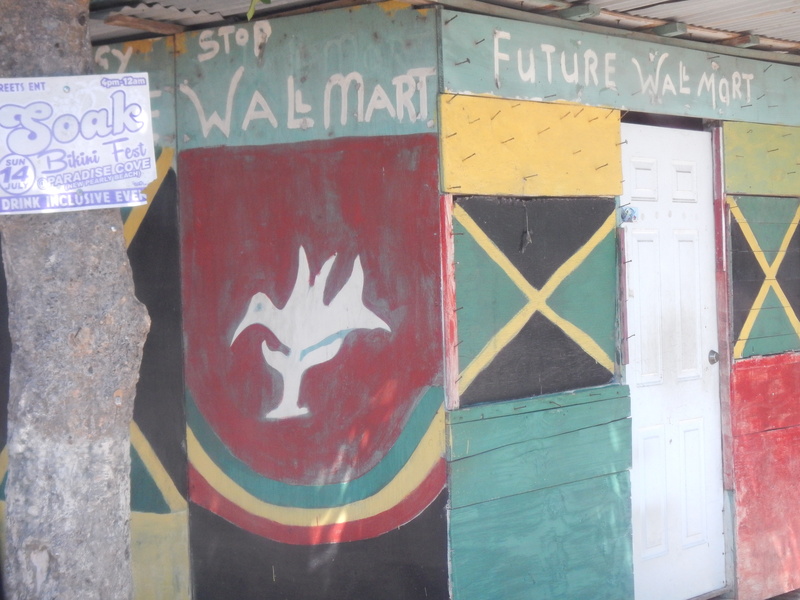 Unfortunately, that port we had a crew drill and we got out too late to go, same for the next visit, I also had an excursion that time (the Jamaican Bobsled… where I feared for my life, but that’s another story). It really looked as if we would never get a chance to take them up on their offer, until…. 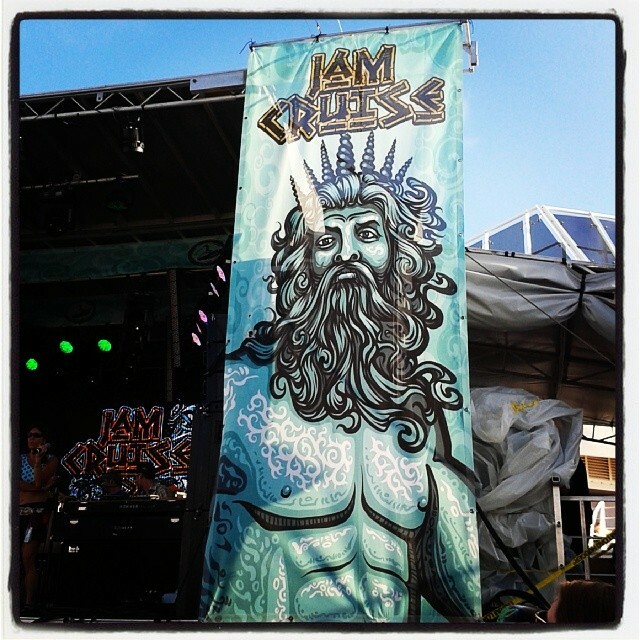 On our 3rd time back in Falmouth it was Jam Cruise. Not only did most of us have it free, there were also excursions. This was the perfect time. Dolphin Cove suggested I bring friends, the more the merrier, and so our merry group of 20 were all busting at the seams for the day to arrive. ….then, Murphy’s Law… I was scheduled to work, which meant, unless there was a miracle, I would miss the trip. But I decided not to complain, not to argue, after all it is my job. Instead, I think everyone else went to my defense, and with 30min before the bus was due to leave I was told I could go!!! Woohoo!!! After we got to meet and touch her it was time to swim with her. Here we had to tap the water and then she would pop up in front of us, lie on her back, we would grab her flippers and then she would swim us back to the pier. Very important was to let go when the trainer told us to, otherwise there was the threat of smashing into the pier as she swam under it…. 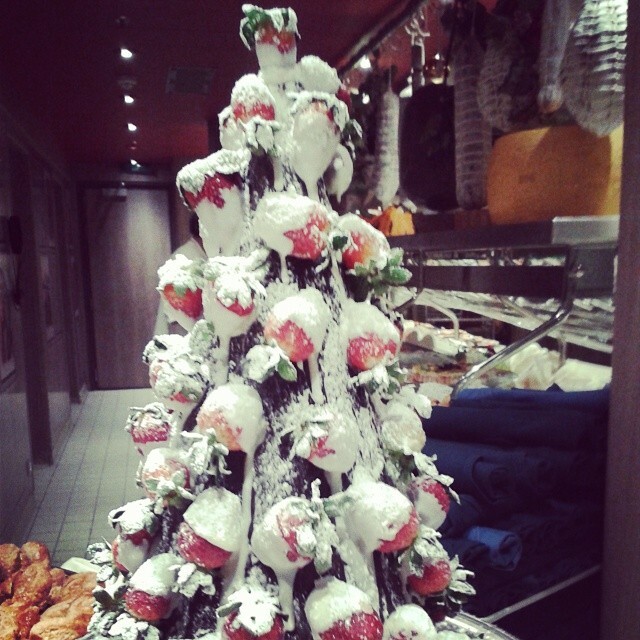 Finally it was the pièce de résistance, the kiss!!! 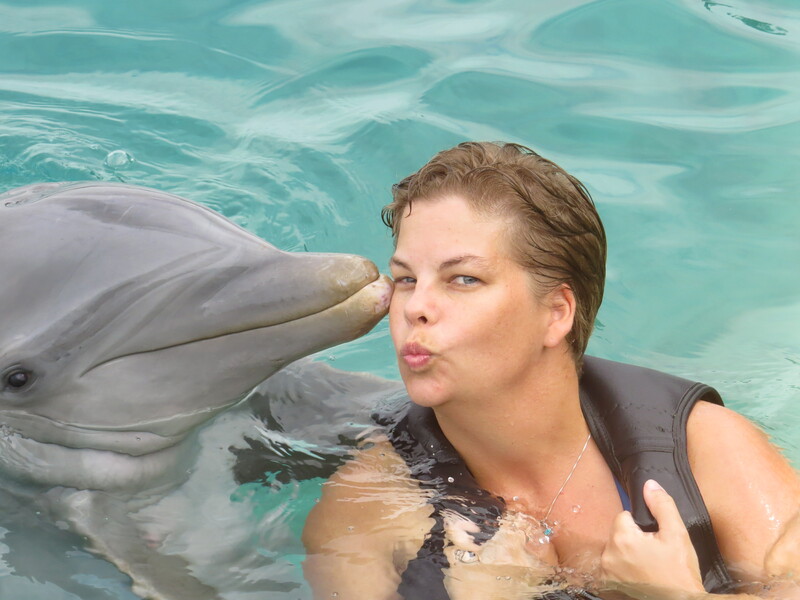 It was a truly spectacular afternoon, and the staff at Dolphin Cove were phenomenal. All the Dolphins seemed happy and looked healthy. 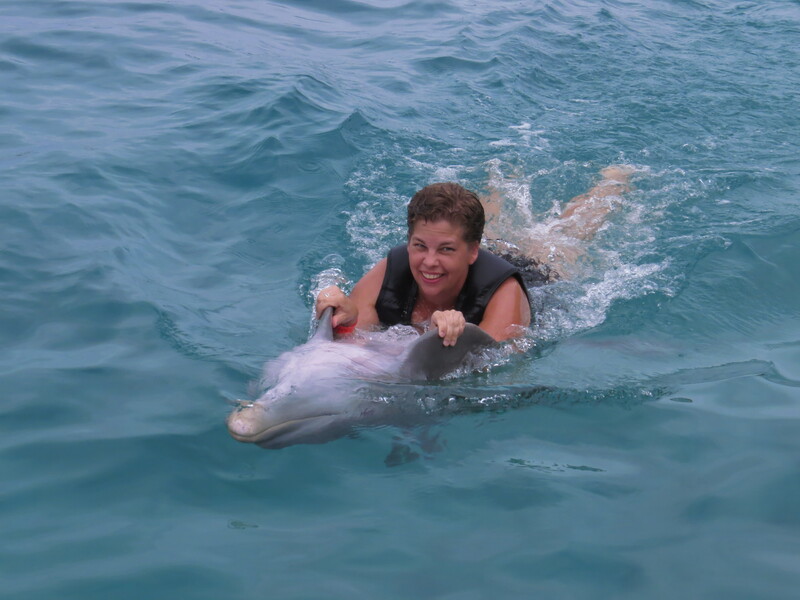 In fact, they have one rescue dolphin who was hit by a boat, during her recovery (to keep her entertained) they taught her the tricks and skills. 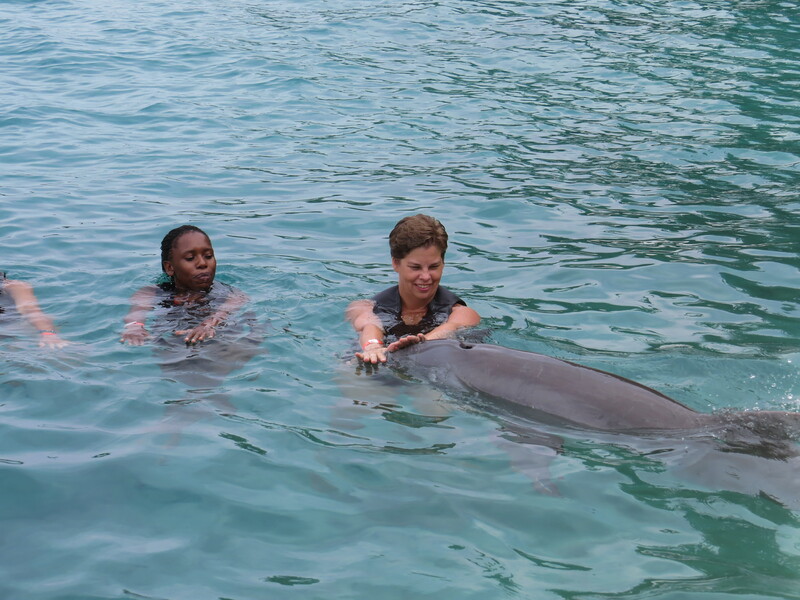 Upon her return to health she was returned to the sea, less than a week later she found her way back to Dolphin Cove and “asked” to stay! I will never forget this day, thanks so much to everyone who made it happen! It is always hard for me to be away from family on Christmas. It is my favorite holiday and I have very fond memories of growing up in South Africa and visiting my grandparents for the Christmas dinner, which was always a large roast with potatoes and yorkshire pudding and gravy and all the trimmings. Now, noting South Africa has a summer Christmas, this was a fairly intense meal, but something that is a tradition in my house (of course now living in Oregon it means it’s cold outside and you feel like eating a lot more). This would not be my first Christmas away from home, but that doesn’t make it any easier. 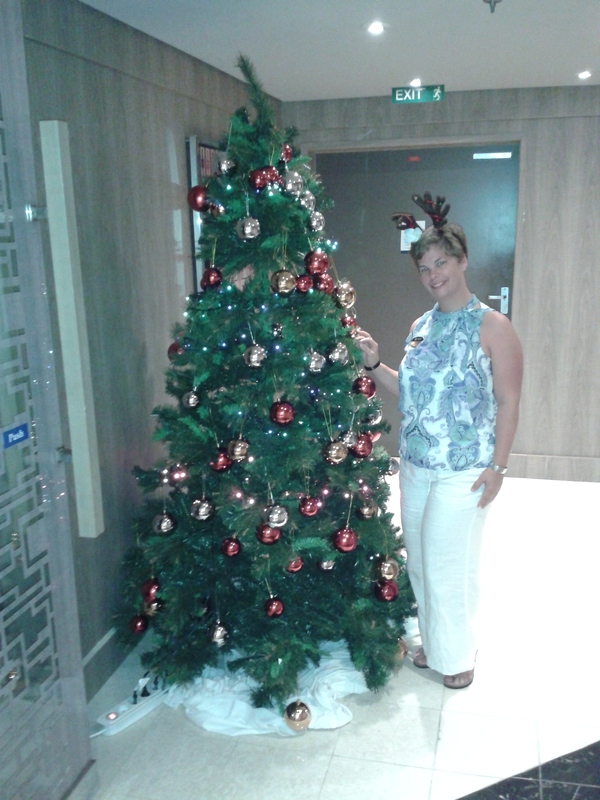 In fact having Christmas while working on a cruise ship can make for a lack of Christmas cheer. 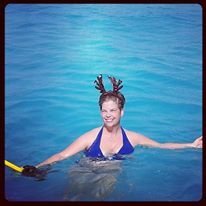 So, you have to really focus on the good things, your friends, your friendly guests (hopefully we all had some) and if all else fails wear a pair of antlers and put smiles on everyone else’s faces. 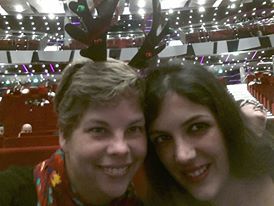 In fact on evenings when I didn’t wear my antlers I had guests asking me where they were. I would wear them in my uniform when I was helping guests at reception, it’s amazing how hard it is for a guest to complain bitterly when the person you are talking to has antlers that jingle everytime she nods her head. Of course, if it became apparent that the antlers would not deter the guest from making a complaint, they were surreptitiously removed. But, for the most part, guests got a kick out of it. 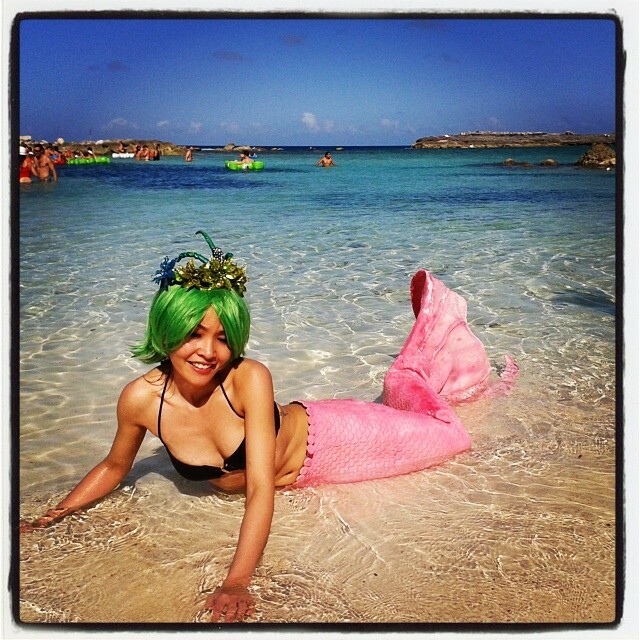 I would also wear them on excursion and got quite a few laughs when I went swimming with them in St. Maartin…. In the US Christmas decorations usually start popping up the middle of October, with the occasional random xmas song, just to get us warmed up. Then come middle of November the radio stations are solidly booked with jolly songs about santa and reindeer and white Christmas. However, on our ship, we only put decorations up the 2nd week of Christmas, so it felt really strange as I am used to having them up for months. One minute they were up the next they were down. We went for a nice sublte, not to over stated, green wreath with a few Christmas trees and red, silver and gold balls. Over all rather elegant, although many US guests were expecting more of an … how shall we say… intense decoration experience. Oh well, this is an Italian ship and elegance is their thing. 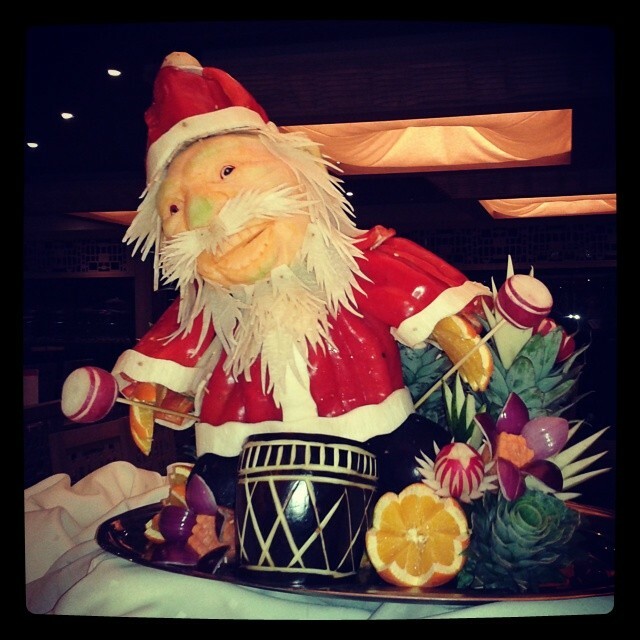 On very special occasions the Chef and his crew create what is called, the Magnificent Buffet, and it is truly magnificent. 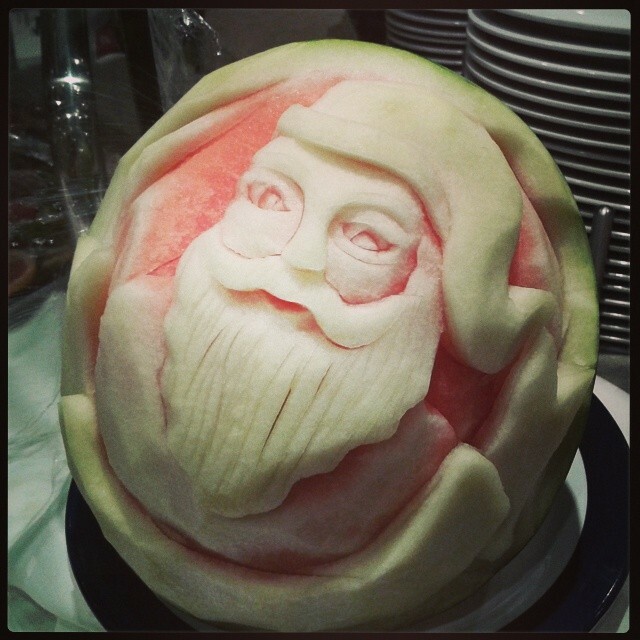 Absolutely everything is either carved, or molded, or assembled out of food or food by products… truly Magnificent. 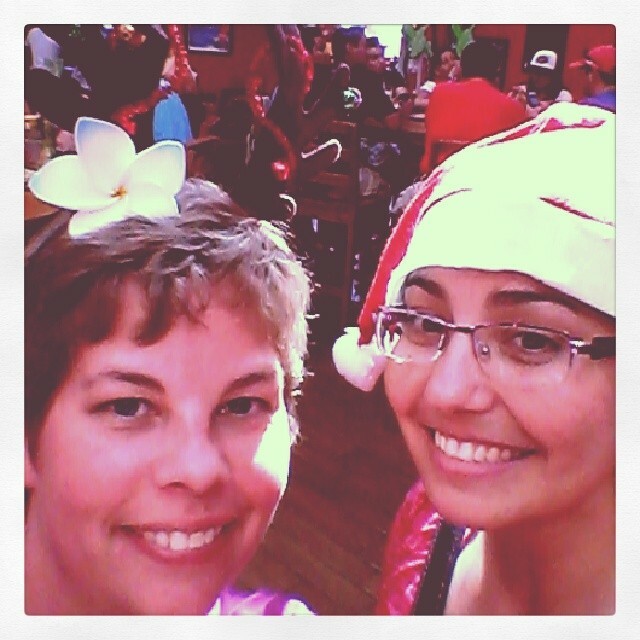 Our department decided to have our own little xmas party. 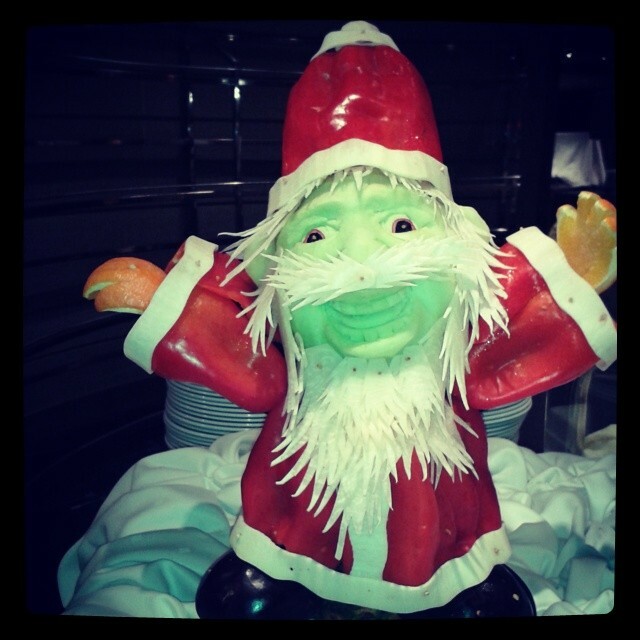 We were in San Juan, Puerto Rico on the day and our International Cruise Director organised it at Signor Frogs. 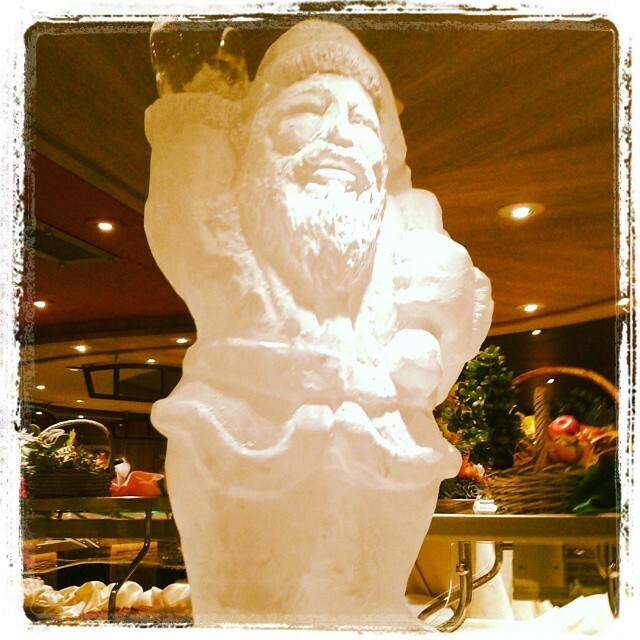 Now, anyone who has been to a signor frogs knows it is all about the booze. We had a buffet as well (am pretty certain refried beans should NOT be a soup like consistancy), but, let’s just say it’s the company that counts. 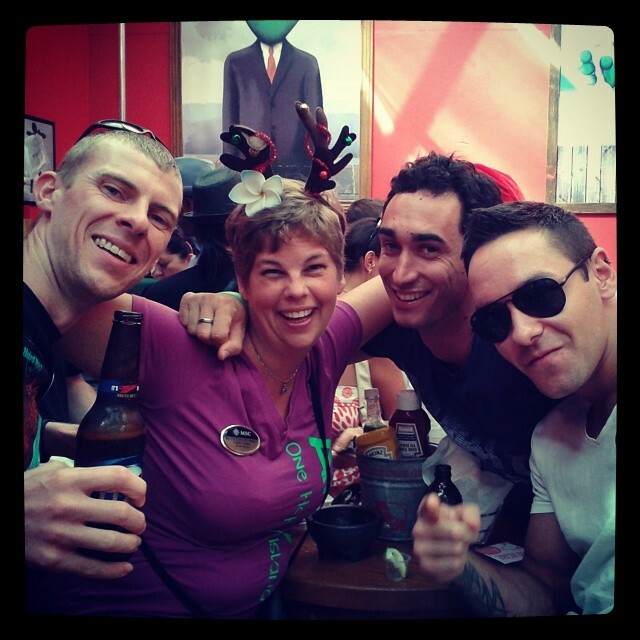 Great fun was had by all… but still, it’s always better with family!! Whenever I travel I have always bought tickets together and it all seemed to flow so nicely. If there was a screw up or a delay, no problem the airline gave you a hotel or meal voucher. But during my attempt to fly to Venice to start my next contract on the cruise ship I experience the horror that comes when tickets are purchased separately and for airlines that are not partners. Checking in was a breeze, although some sweet talk was required as my bag was overweight but, hey, I am on a seaman’s ticket. They checked my bags all the way to Venice, even though the tickets were separate. However, they couldn’t give me my boarding passes but all I had to do was pick them up at the kiosk, no problem. She also casually informed me that, due to San Francisco’s infamous fog, flights were delayed but again, no problem, I should make my flight. Ultimately we left at 1.30pm, but with the absolute assurance from all involved that making my 3.30pm flight would be a snap. When we landed I had just over an hour and all I had to do was jog over to Air France, grab my boarding passes and head to the gate. No Problem!!! Let’s rephrase shall we: I RAN down through the domestic terminal to the international terminal that was “right next door” and tried to find the Air France counter. I finally got directions and sprinted dragging my carry on behind me. Rounding the corner to the Air France counter I discovered nothing… no-one….nada…. the counter was closed, with still an hour till the flight. I tried the kiosk but kept getting a “Do not recognise flyer” message. By now panic was rising, the tears were forming, the sweat was poring, I HAD TO MAKE THIS FLIGHT! I saw a young man and asked if he worked at the counter, he said yes listened to my desperation and went to find the supervisor. Both of these guys had been on their way to lunch…. not anymore. The supervisor told me gate closed, no go, have to rebook. As I was waiting for them to get me a phone number a French couple rounded the corner with the same look of desperation. Turns out they had the same problem flying in from a different airport. The Air France guys gave us the number, said sorry and disappeared as fast as their little feet could take them. Although the young guy did really want to help more. For both of us the answer was that we had booked on separate airlines so that means there was nothing they could do, they couldn’t rebook us, they couldn’t give us information… nada!! Customer Service at its best!! Then we headed off to United to see if there was anything the counter could do. Once again it was a dead end, they could proved us a note claiming we missed our next flight due to a delay and a coupon for a hotel discount, but nothing else. Also they weren’t sure where my bags were, but we relatively certain they were somewhere in the airport… fantastic! A good friend suggested we go see Delta, as they are partners with Air France…. it couldn’t hurt really, we had hit a wall at every possible attempt. The staff at the Delta Air counter in San Francisco were not only kind and friendly they were downright incredible, phenomenal and pretty damn awesome. We spent 5 hours at the counter but they would not give up. The first lady could not help me but she was able too sort out the couple’s tickets with just a small change fee. Then just as I was about to give up, after trying to call any number I had to reach someone in Italy… an amazing member of the Delta team put his foot down and was determined to discover a way to get my ticket sorted. He would not give up, and eventually against all odds, possibly with a little magic involved he handed me my tickets for the next flight and even had me do online check in and choose my seats. I wanted to kiss him, all the stress and strain dissipated. During this miracle of reticketing, I went to United to find my luggage. They had no record of it other than when it was scanned to go onto the airplane in…wait for it…. Eugene, OR. So either my bag was still on the Eugene flight, or it had been transferred and was flying to venice or it was backstage somewhere in the airport. At that point it just didn’t seem like a big deal… am was sure I would find it the next day. The 3 musketeers left the airport and headed for our hotel feeling utterly exhausted, bordering on starvation but not defeated now that Delta had saved the day. After a shower and rest we celebrated the insanity of the day over dinner and drinks and then planned to meet the next day at the airport. In the end I made it to Venice, the Air France flight was great, I had a whole row, great movies and good food. But the stress to get there just proved the fact that buying tickets all within the same partnership can significantly diminish stress when delays occur. 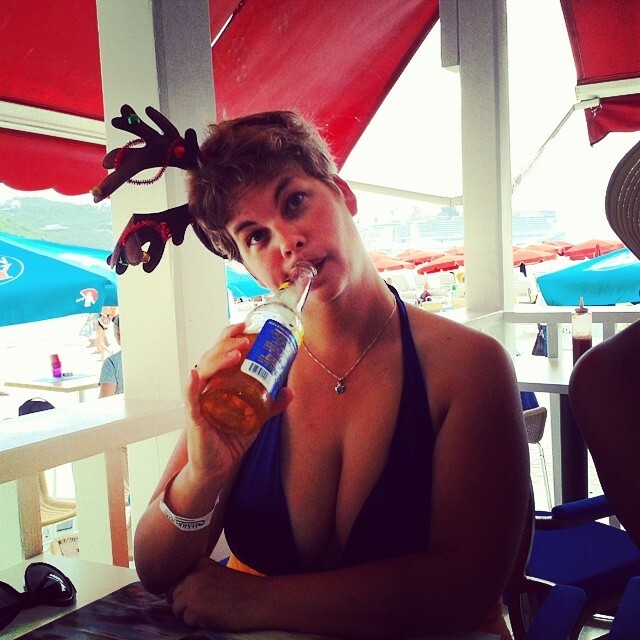 As for making it to the ship…. I did, barely, but that’s a story for another time.